Tony writes: Hang around the grill aisle at Home Depot or Bed Bath and Beyond long enough (and I do… regularly) and you start to wonder about the vast sea of bbq gadgets and tchotchkes. Are any of them worth a purchase? Maybe it’s the recent heat wave (which has given me an overpowering urge to grill literally everything) or maybe I’m just losing it, but I’ve transitioned from grill-gadget browser to buyer. 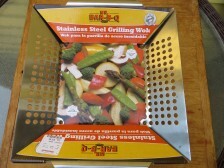 My first big purchase was a stainless steel perforated grill basket a week ago (a Mr Bar-B-Q for $12.99). I know – these baskets have been around for forever (all the way back to campfire cooking) – but I finally felt compelled to give one of the sturdier-looking ones a test drive. 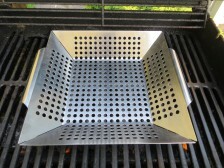 The baskets’ basic premise is to make things that don’t fit on the grill – ie: small/thin vegetables – grill-able (so they can’t fall through the grates) Clearly, if these baskets were a grilling necessity, they would already have become part of the cannon. But most grill experts are traditionalists; maybe there are some lands left to discover. The technique: Holes or not, I decided to treat this wide, flat basket like an outdoor saute pan: set it over a hot fire and then grill/shake like-sized ingredients for a couple of minutes until browned and cooked through. It was only natural to co-opt the method into a stir-fry. Wok cooking relies on intense heat that, when executed properly, produces a smoky flavor similar to grilled fare (this smokiness is known as wok hei; in her master tome The Breath of a Wok, Grace Young explains it a heck of a lot more elegantly). The basket could mimic true wok cooking, only outside (where it won’t smoke out the house). I sliced up some pepper and red onion, trimmed snap peas, and cleaned shrimp and then tossed them all with a little oil, salt and pepper. 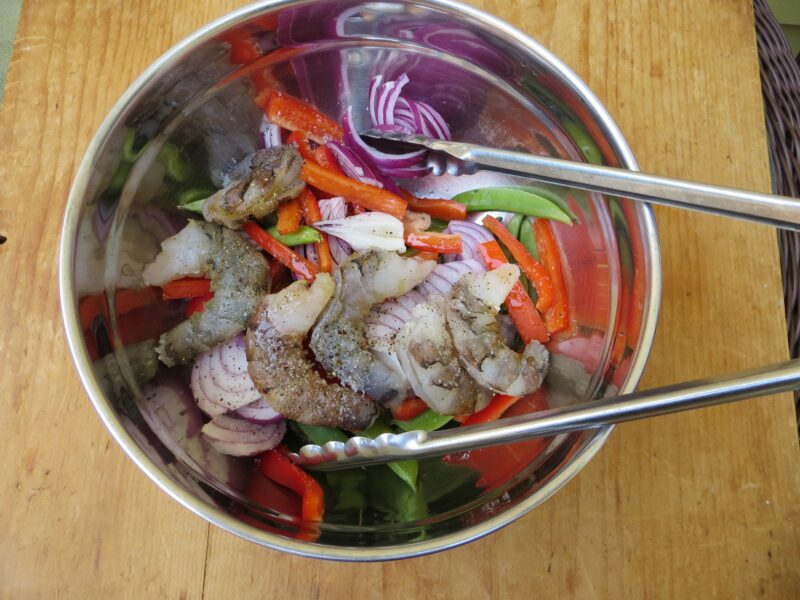 I grilled the shrimp and vegetables, shaking, until browned and cooked through. And then the sauce. Unlike a true stir-fry, this one would have to be sauced off the heat, so I transferred the grilled stir-fry to a large bowl and tossed with a light mixture of rice vinegar and sesame oil. And it was good, good enough to repeat a couple of times since. Perhaps as important to this tale, the clean-up was mostly successful. Warm water and soap cleaned off all of the grilled debris from the basket. And though it would be hard to imagine the basket lasting more than a couple of grill seasons, at $12.99, it’s worth a buy (and this recipe worth a try). 1. Prep: Light up the grill (heat the gas grill to medium-high or prepare a medium charcoal fire). Peel and devein 3/4 lb. shrimp (preferably 16-20 count); rinse under cold running water, then pat dry with paper towel to remove all surface moisture (this is important so the shrimp browns properly). Thinly slice 1/2 red bell pepper and 1 red onion. Remove the stem ends of 1/2 lb. snap peas (and discard the stringy seams running along the sides). 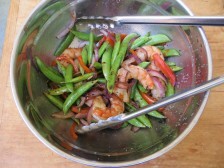 Add the shrimp and vegetables to a large bowl and sprinkle with 1 1/2 Tbs. canola oil and S+P (about 3/4 tsp. each). 2. Grill: Heat the empty basket over the fire for 3 or 4 minutes so it gets good and hot. Add the shrimp and vegetables and cook, undisturbed for 1 to 2 minutes, until they start to brown. Using tongs and a grill mitt (or a folded dish towel), stir the ingredients so they flip and cook through all around (check the shrimp with a paring knife), about 2 to 3 minutes more. 3. Toss with flavorings: Meanwhile, in another (clean) bowl, whisk together 1 Tbs. toasted sesame oil, 1 Tbs. rice vinegar, 1 Tbs. soy sauce, 1 tsp. Sriracha sauce, and 1 tsp. granulated sugar. 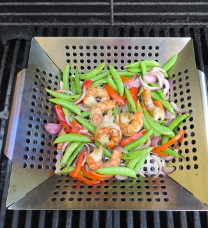 Add the grilled shrimp and vegetables and toss well. 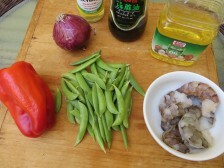 Add more of any of the ingredients to taste and serve with steamed browned rice.